Tellabs Titan 532L models give your network a boost for transports, routes and grooming data for 911 services, FAA radar traffic, cell networks, Lotto networks and ATM offerings. You can use the 532L to connect small networks together and build something greater, such as all ATMs connecting to the 532L so it can groom signals together and send those to the bank. The Titan digital cross-connect systems are industry standards for switching traffic from one circuit to another, connecting traffic inside and between networks. The 532L model is a powerful family member that allows for more robust and smarter switching with a broader set of tools, whether you’re working on the latest metro networks or need to shore up older 911 and mobile platforms at the edge of your network and in rural locations. Tellabs has moved its focused to metro OLAN technology and enterprise services, but its cross-connect gear can still be the right fit for many growing networks in multiple configurations. 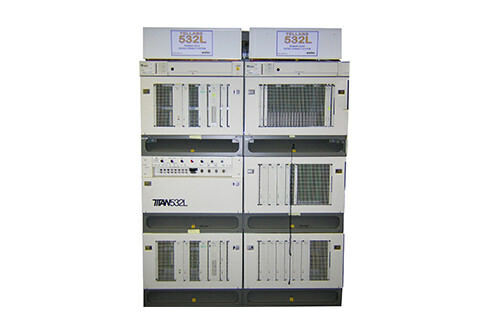 Worldwide Supply offers a variety of used and refurbished Tellabs Titan 532L parts and equipment to help you improve your network where you need it most. We offer one of the most comprehensive warranties on refurbished equipment plus a maintenance package that’s OEM-neutral, so you can protect your gear with one plan instead of trying to manage 20. All repairs, maintenance and refurbishment work is done in our in-house lab with real-world testing scenarios so you can be sure everything exceeds the standards you need.